In a fashion similar to the movement of prey items, the movement of consumers can be a mechanism creating spatial subsidy. As in the other examples presented here, this can occur between two terrestrial habitats, two aquatic habitats, or between terrestrial and aquatic environments. There are numerous examples of terrestrial mammals that make forays into aquatic habitats in order to forage. In fact, there are over 45 species of terrestrial mammals documented to feed at least in part on marine resources, consuming over 200 marine taxa. For some terrestrial mammals, such as coyotes (Canis latrans), this consumption allows predator population densities to persist several orders of magnitude over what it would be in areas without the ability to forage on marine foods (Figure 3). This increase in population density of these omnivores in turn allows them to depress other prey resources such as small rodents, thus leading to 'apparent trophic cascades', where subsidized consumers are able to exert a greater force on the local food web than would be possible based on in situ resources alone. 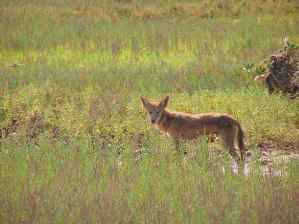 Figure 3 A coyote (Canis latrans) foraging on marine organisms in an intertidal salt marsh. Coyote densities in coastal regions can be more than an order of magnitude higher relative to areas where they receive no marine spatial subsidies. Photo Credit L. Goodwin, Aquatic Adventures Science Education Foundation. the habitats they inhabit. One is that the higher nutritional quality and abundant resources of the agricultural fields have caused a boom in population density for many species of geese. This, in turn, leads to an 'apparent trophic cascade', with the abundant birds completely altering marshes in which they either did not feed historically or generally had lesser effects. The geese thus caused massive loss of vegetation and irreversible changes to soil conditions in many coastal marshes, with consequent loss of soil invertebrate species and impacts on those predators that use them (such as passerine birds and shorebirds). As in the case of movement of prey items, consumer movements creating spatial subsidy occur across a range of habitat types and temporal and spatial scales. Krill move seasonally between feeding on algae beneath the Antarctic ice shelf to feeding on pelagic phytoplankton; a number of aquatic predators make foraging migrations over a broad range of spatial scales, in horizontal or vertical directions; a species of side-blotched lizards on the terrestrial-arthropod poor Islas Encantadas archipelago in the Gulf of California rely so heavily on intertidal food resources that they have evolved enlarged nasal salt glands to assist with removal of excess electrolytes; and humans forage across vast ranges of terrestrial and aquatic habitats, bringing back trophic subsidies from the interior of continents to the depths of the oceans. The movement of consumers across boundaries is a key factor in the cross-system exchanges represented by spatial subsidies. Such exchanges are often driven by ontogenetic shifts in an organism's foraging or habitat-use pattern, but can also be realized whenever mobile consumers have the ability to cross a habitat boundary.